On the day of the royal wedding I was arrested for being in fancy dress. I had gone to Soho Square to report on the zombie flashmob I’d heard about on Twitter. I planned to take photos, interview people, and report on it for a friend’s zombie blog. Five of us left the area when it looked like we might be kettled. We decamped to a nearby Starbucks to drink coffee and talk zombie movies. From there we were stopped and searched, arrested, handcuffed and held in police cells for hours. The reason: police interpreted the flashmob as an anti-royalist protest. We were arrested for a ‘breach of the peace’. Two weeks ago the High Court dismissed four separate Judicial Reviews that myself and others brought against the Metropolitan police. The stage is set for extremely heavy-handed policing over the Olympics, and the crackdown has already begun. My Judicial Review was made up of fifteen people arrested for speculative breaches of the peace on the day of the wedding. The other three consisted of one minor arrested pre-emptively for the criminal damage he could have committed with two pens in his backpack, and two Judicial Reviews about riot police raids on squats the day before. The police came with warrants to search for stolen bike and computer parts in the Ratstar squat, and paintbombs at Grow Heathrow. In execution the police were more interested in finding out the residents’ identities: they searched squatters’ wallets looking for ID at Grow Heathrow and took all toothbrushes from the Ratstar in what the plaintiffs’ lawyers say was a sweep for DNA. Others in my own Judicial Review included members of the Charing Cross 10 – a group of republicans arrested on their way to the Red Lion Square’s republican street party, a ‘known activist’ arrested simply for being near Trafalgar Square, and one woman – arrested along with her friend, because one of them has a flyer about the flashmob in their pocket. In court the Met’s barrister classified our arrest as a category 2 breach of the peace – which means that we weren’t arrested because our own actions were believed to be criminal but because our presence could provoke ‘not wholly unreasonable acts of violence’ from others. In our case the ‘others’ were indisputably taken by both sides to mean royalists. The weekend after our court hearing was the Jubilee. 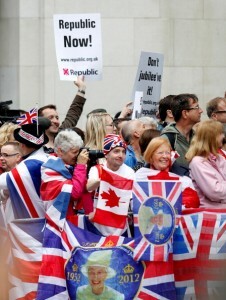 After my own experience the year before, I went to Republic demo by the Thames as a legal observer. Hundreds of people stood holding placards with slogans like ‘down with the crown’ while an endless stream of royalists walked past. Some booed. Others told them to go home. A few sang God Save the Queen at them – that was it. That was the apparently volatile mix of republicans and monarchists which the police had arrested me to prevent. Our arrests did not happen in isolation. They are part of what many civil liberties groups point to as a pattern of an increasing de facto criminalisation of protest. Increasingly, those attending demonstrations know they may be photographed, stopped and searched, or kettled without access to food, water or toilets. In the student demonstrations of 2010 the Met kettled school children in sub-zero temperatures for hours. One hundred and forty five UK Uncut demonstrators were arrested and brought to trial for ‘aggravated tresspass’ simply for sitting down in Fortnum and Mason. Increasingly, it seems, the police want to put people off demonstrating – and for the regulars who are assumed to be ‘ringleaders’ the police find ways to tie them into lengthy, expensive and exhausting legal battles. In our High Court hearing we were hoping for a judgement which ruled that the police acted unlawfully over the royal wedding. A judgement which could have clarified that holding (or being suspected of holding) dissenting opinions does not give the police licence to arrest people or raid their homes with riot police. As it stands: the current judgement has set a troubling precedent. In stating that the police did not act unlawfully, the high court has in effect given licence to the police to do the same again. We are looking into appeals, but in the meantime the crackdown for the Olympics has already begun. On the 17th of July former graffiti artists (some who had only ever done corporate commissions, others who had not been active for years) were arrested and bailed with conditions banning them from going within a mile of any Olympic sites. On the night of the opening ceremony over 130 Critical Mass cyclists were arrested under Section 12 of the public order act for causing a public nuisance. Their bike ride has been a monthly event for many years and their right to ride without notifying the police was upheld by the House of Lords in 2008. The cyclists were released with bail conditions banning them from coming within 100 metres of an Olympic venue. Tolerance and free speech are proud parts of our tradition. Over the next few years more and more people will have reasons to protest. Those in power know this and are acting pre-emptively to stop dissenting voices being heard, and the clampdown is affecting even those suspected of being dissenters. My own experience with fancy dress was clearly frivolous, but this is the thin end of a very sinister wedge. Posted in Activism, Blog, Court case, Rabid Enthusiasm, ShowreelTagged crowd funding, high court, Judicial Review, legal action, legal aid, metropolitan police, precrime, royal wedding, the IndependentBookmark the permalink.